Regardless of the size of the vehicles, and often despite the utmost caution, operating vehicles can be a risky endeavor. According to the National Highway Transportation Safety Administration, highway accidents accounted for 37,461 deaths in the U.S. in 2016.1 Moreover, a recent study by Motus, a vehicle management and reimbursement platform, found that 40% of all motor vehicle accidents are work-related and cost employers a staggering $56.7 billion in 2017, taking into account medical expenses, property damage, increased insurance premiums, and lost productivity.2 While liability insurance is an important way for employers to address that risk, it’s by no means a panacea. Companies can and should be doing more to lessen the likelihood of accidents in the first place. And given that the vast majority (94%, according to NHTSA’s study) stem from driver-related actions or inactions as opposed to equipment malfunctions, one of the most important ways of doing so is to ensure that the individuals who drive in connection with their employment (including those who do so for a living) are safe drivers. In the Firm’s experience, companies that carefully and continuously vet their drivers are not only better positioned in their defense of catastrophic accidents but are also much less likely to find themselves in that position to begin with. Additionally, these companies often have a much lower risk profile than their peers and can leverage that fact in their negotiations with their insurance providers. 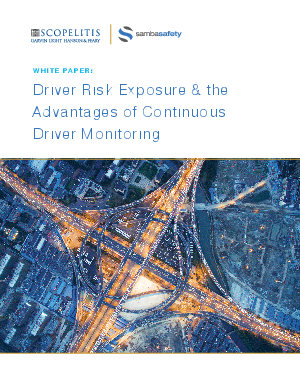 This paper explores the added benefits of continuous driver-monitoring services.